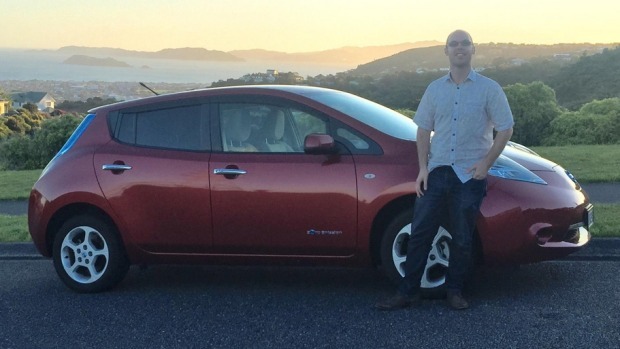 When Wellingtonian Sigurd Magnusson read a friend’s blog about owning a Nissan Leaf, he realised he didn’t have to wait for EVs to become mainstream to own one himself. Now he’s got one, he can’t believe how much he enjoys driving it. When he first got the Leaf, Siggy charged it every day at home, and tried once a week to charge it somewhere else. With Wellington’s growing EV infrastructure, that’s got easier. Also easier to cope with was his ‘range anxiety’, because the car tells him exactly how much battery life is left. Anxiety has shifted to practicality – he just needs to keep in mind where the closest charging point is if he’s doing a lot of driving. Siggy’s whole family has caught the EV bug. His kids love it, and complain if they have to go in the family’s petrol car. They are really aware of pollution, and much prefer to travel in the EV. Other people are astonished that EVs really are a ‘thing’, something they can go to a dealer and buy. For Siggy, there are a whole lot of reasons to champion an EV as the way of the future. Most important is the environment, and the ethics of actually making a difference if you can.